“Between August 1939 and September 1941, over 70,000 mentally and physically disabled inmates of sanatoria and asylums in Germany and Austria were murdered after doctors certified them as ‘life unworthy of life’. The victims were transported to one of six clinics equipped with gas chambers where they were poisoned with carbon monoxide gas piped through false shower heads in mock bathrooms.1” The programme was suspended once relatives and others protested and “instead, the personnel, expertise and technology of mass murder were transferred to the killing of Jews… The commandant of Auschwitz concentration camp experimented with lethal Zyklon-B (cyanide) gas 2”.The Girl, my daughter, has Down Syndrome and would have been included in the Nazis’ medicalised murder of the disabled under this ‘T4’ compulsory euthanasia programme. On 11th February this year I visited the Auschwitz-Birkenau concentration and death-camps on behalf of the Cardiff Times, at the invitation of the Holocaust Educational Trust (HET)’s Learning from Auschwitz (LFA) Project, along with two hundred or so 17-18 year old students from across Wales. In a complementary article (see page… ) I have detailed the aims of the LFA Project. Next month I shall write a follow-up piece detailing the reactions of some of the trip’s Cardiff students. Here, I want to address how it felt being at Auschwitz-Birkenau, drawing also on the reflections of those who survived the camps. But I hadn’t expected such a clear link between that dark past and The Girl’s present. Let me begin at the end. I got home around midnight of what had been a long day’s travelling. The Boss welcomed me home with a hug and asked what it had been like. Then the tears came. All I could find the words to say was “vile vile vile”. I imagine that this would be the reaction of any thinking person of reasonable imagination and normal levels of empathy. At this place over 1.2 million people were robbed, degraded, and tortured, broken, gassed, and cremated. Primo Levi 3 writes that even “dawn came on us like a betrayer; it seemed as though the new sun rose as an ally of our enemies to assist in our destruction”. A Polish woman was our official guide to the camp. Gently-spoken, she had been in the job eighteen years. I noticed that she never once referred to ‘the Nazis’ only to ‘the Germans’. She told me of the large number of Poles put to death at this camp. “The Germans regarded us as untermenschen, sub-humans, who would be culled and those left put to work as slave labour”. Levi, again, noted that “to destroy a man is difficult…but you Germans have succeeded. Here we are, docile under your gaze; from our side you have nothing more to fear; no acts of violence, no words of defiance, not even a look of judgement”. 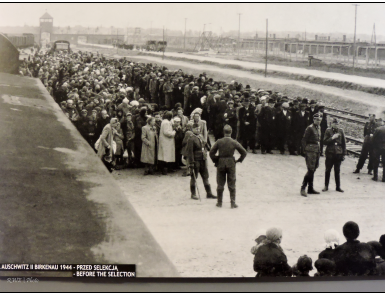 The Auschwitz complex was vast, including 48 sub-camps, and was the largest of the Nazi camps. Auschwitz I was a concentration camp used for political prisoners, prisoners of war, Roma, Sinti and Jews. 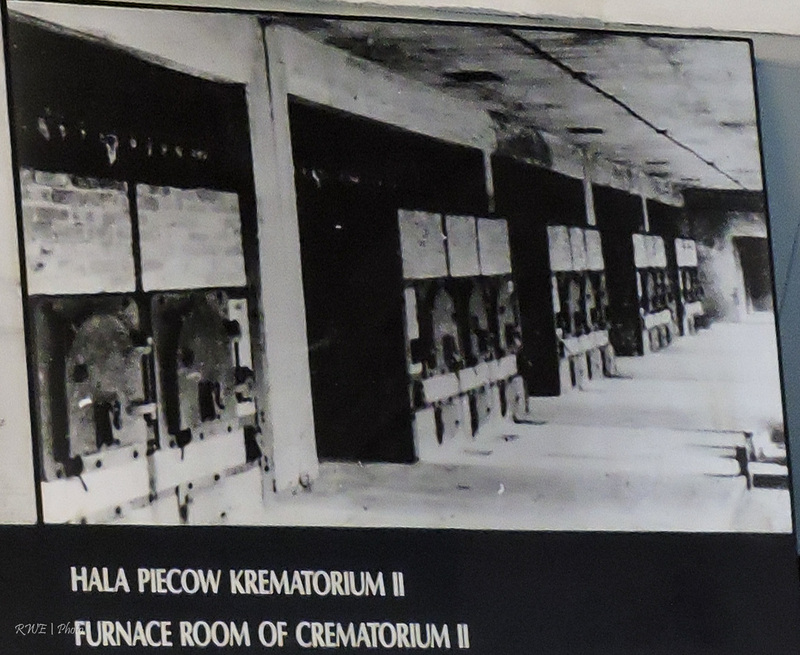 It held around 15,000 inmates and had its own prison (Block 11), gas chamber and crematorium. It was here that Zyklon B was first used to kill significant numbers of people (600 Russian PoWs and 250 sick prisoners). Auschwitz II at Birkenau developed to become the main extermination centre and a slave labour camp, eventually expanded to hold up to 200,000 prisoners. Old farmhouses were used as gas chambers until four crematoria and gas chambers were established. Entering Auschwitz I we walked beneath the sick joke inscribed above the gates: ‘Arbeit Macht Frei’, Work Makes You Free, where the process of destruction gained momentum. “For the first time we became aware that our language lacks words to express this offence, the demolition of a man…; we had reached the bottom…Nothing belongs to us any more; they have taken away our clothes, our shoes, even our hair; if we speak they will not listen to us, and if they listen, they will not understand. They will even take away our name: and if we want to keep it, we will have to find ourselves the strength to do so…so that something of us, of us as we were, still remains” (Levi). 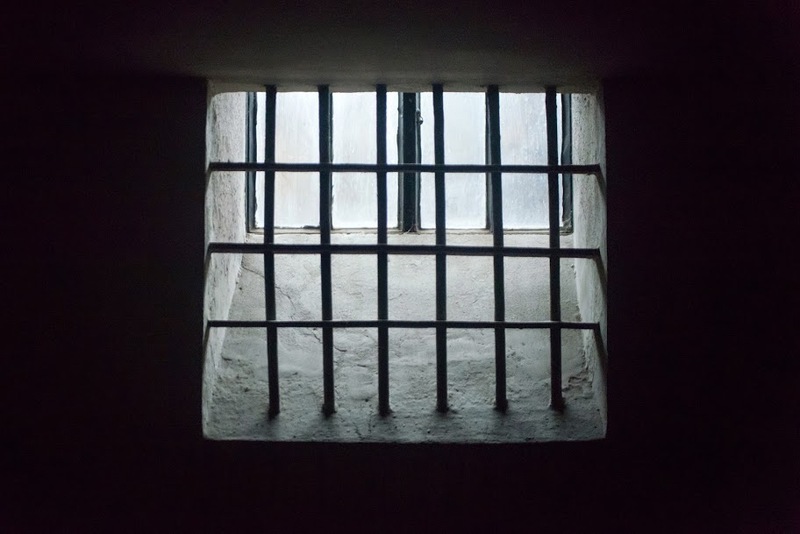 We saw the piles of shoes, of hair (literally tons of it – think of the numbers murdered, that hair could be weighed in tons), of artificial limbs, personal and household objects stripped from the prisoners. For a father of a little girl, these were of course upsetting. But what left the largest scar on my psyche was Block 11. Here were the mock-trial rooms (nobody was found not guilty). Outside was the Death Wall, where prisoners were shot often after being taunted with ‘jammed’ guns. Next to this wall of death were torture posts where people’s hands were tied behind them before being hauled up to hang from the wrists. Inside were cells where people were starved to death; or gassed; or crammed together four to a bricked space no bigger than a phone box all night long – if suffocation didn’t kill them then the full shift of work they were made to endure each subsequent day probably would. I still cannot assimilate that in the middle of a death machine, the Nazis needed to find ways to make prisoners’ lives even more unbearable. The scale and size of Birkenau is to this day staggering. The stables converted into barrack-rooms, poorly built and crammed-full, that inside were the same temperature as outside – whether that was the bitter cold of Polish winter or the sweltering heat and insect-filled furnace of its summer months. The cattle trucks used to transport Jewish families, whole communities, from all over Europe. The stinking, open, unplumbed toilet and washing complex. The railway lines: Auschwitz itself was chosen because of its accessibility to railway lines from across the continent; but these lines were built right into Birkenau itself, the better to speed people to the gas chambers. Elie Wiesel 4 remembered the eight fateful words that took his mother to the chambers“Men to the left! Women to the right! …I did not know that in that place, at that moment, I was parting from my mother and [sister] Tzipora forever. I went on walking. My father held onto my hand…”. 11th February 2015 was also a grey, dank, misty day. I thought that if ever I was going to see ghostly spirits it should be there and then, at that moment in that place. We were gathered at the literal ‘end of the line’ at the far side of Birkenau. A few short steps further on were the Holocaust Memorial with its flag in the colours of the “loose, striped, insect-ridden clothing” 6 that was the uniform of the prisoners. A few steps in another direction were the remains of the crematoria. As we all lit candles a Rabbi told us that the issue was not “where was god?” but “where was humanity?” and I thought that he was half-right at least. It was almost unbearably affecting when Rabbi Marcus led us in a rendition of Psalm 23 (“The Lord is my shepherd”) noting that we were surely standing in the cold heart of the valley of the shadow of death. I came home and was reminded of books I had read written by survivors of that place, of those places; men and women who had seen the very worst things imaginable – in themselves and in others – and come through both that public hell and their own private inferno. Viktor Frankl 7, who wrote “everything can be taken from a man but one thing; the last of the human freedoms – to choose one’s attitude in any given set of circumstances, to choose one’s own way. … In some way, suffering ceases to be suffering at the moment it finds a meaning, such as the meaning of a sacrifice. … When we are no longer able to change a situation, we are challenged to change ourselves”. Even in Auschwitz-Birkenau he found that “…humour, more than anything else in the human make-up, can…rise above any situation, even if only for a few seconds”. Primo Levi found “that no human experience is without meaning or unworthy of analysis” and Frankl also felt that “man’s main concern is…to see a meaning in his life” and that even in such places “…one must want to survive, to tell the story, to bear witness… we still possess one power – the power to refuse our consent” (Levi). Remembrance, bearing witness, finding meaning even amongst futility and death. And, most of all, holding on to love. Frankl writes: “I saw the truth, the Truth – that love is the ultimate and highest goal to which man can aspire…The salvation of man is through love and in love. I understood how a man who has nothing left in this world still may know bliss, be it only for a brief moment, in the contemplation of his beloved. In a position of utter desolation, when man cannot express himself in positive action, when his only achievement may consist in enduring his sufferings in the right way – an honourable way – in such a position man can, through loving contemplation of the image he carries of his beloved, achieve fulfillment”. “What is Eddie for? …Nazis sent people with Down’s to the ovens, because they polluted the purity of the race. And… we should remember that most women pregnant with a baby with Down’s syndrome choose to abort. It’s clear that many people believe that a child with Down’s has no point… [And] shouldn’t an individual contribute something to society? Eddie’s function is to be loved, and to love in return. Perhaps that is everybody’s ultimate function. Eddie enriches the lives of his family and enriches the lives of those he comes into contact with outside. That seems to me to be a life right on the cutting edge of usefulness” 8. When I got home that night I told Nikki that the place was vile. Vile is an anagram of ‘evil’. Yet I believe there is no external propagator of evil; it is what happens when humanity is removed from others by those themselves lacking in imagination and/or empathy. As I was crying in Nikki’s arms our dog began howling – she never does this. She kept putting her paw onto my hand, eventually jumping onto Nik and me, burying her head in my chest. Knowing how illogical these words are, it still struck me that our dog showed more empathy then the whole of the German High Command; more than all those who attended the Wannsee Conference in January 1942, where the ‘Final Solution’ was launched upon by unempathetic humans. Perhaps true evil is what humans do to one another when they are able to imagine the outcome but choose not to empathise.